I’ve been moving in slow motion or that’s what it feels like. I’ve been all over the place this weekend and needless to say, getting nothing accomplished. This is all I made this week. I’m going to use these are charms but on what is still to be determined. 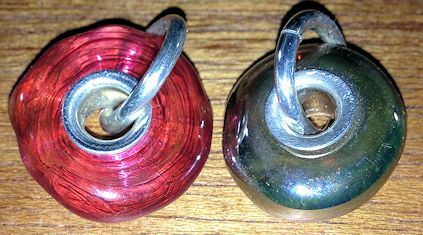 They are both glass that I cored with silver. The right one is out of silver glass and it really shines more than in the picture. The pink one is made out of what’s called “veiled” glass. It’s just a mixture of two or more colors of glass together in one rod.